Okay, so I get it. It’s October, the leaves are getting crunchy and people are losing their heads over everything pumpkin related. You could say that I’m deep in the throes of my own obsession, and I just might be but the real question I have is why isn’t everyone going berserk over pomegranates?! They are the real jewel of fall… pun totally intended. I get super excited every autumn for the reappearance of pomegranates that do not cost $6 a pop at my local grocery store. Now, we are still talking like $2.50 per fruit, but that’s pennies compared to what they go for in the spring and summer. Sometimes I can’t even find a container of the arils. Not only am I a complete maniac over their gorgeous color, I just absolutely LOVE to use them as a snack, in yogurt, in chicken dishes and of course, in salads. Since I’m a bit fanatical over that little thing called texture, their juicy pop does me in. Flipping out over it. I also think they are totally refreshing. I have been known to sit on the couch with an actual pomegranate in a bowl and pick out the arils one by one. I’m living in a world where the leaves appeared to have changed colors over night. This past weekend we planned on taking a nice little fall drive (because we are 85 years old) but it just seemed so… green. Instead we sat around and ate our weight in homemade chicken cheesesteaks, played on pinterest until our eyes hurt, watched so much TV that I don’t even know what real life is anymore and cuddled on the couch, which translates to laying on our own sides of the sectional since we desperately like our own space. I also put a major dent in a container of Trader Joe’s pumpkin ice cream, and for someone who has been eating pumpkin ice cream for 20 years or so, I actually think their version is the best one. Good old Joe. I’ve got a spoon in it now. But then yesterday, I wake up and boom – the trees are suddenly red and orange and fifty shades of yellow. Can’t it be the weekend forever? This salad is practically a big, fat copout – it’s quite similar to my autumn panzanella from a few years ago, but a few quick changes make it diverse enough for me. You can really throw it together in less than 20 minutes or so, but it definitely constitutes and entire meal. 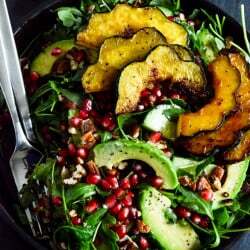 The squash just MAKES it. I love roasting them in the skin so they can be little handheld snacks. For this particular acorn squash, I caramelized it in some coconut oil and a little brown sugar. I don’t know why but those two things make thing a complete flavor explosion, if I can be so cliché. Plus, they look like adorable little crowns or something with their pretty scalloped edges. So cute. Says the person who now calls her food cute. Some other little bits to give it an autumn kick include the toasted spiced pecans. You can swap those out for almonds or walnuts or hazelnuts or no nuts – whatever floats your boat. I threw them in with the arils for the extra crunch crunch crunch. A salad is one of the few dishes that I don’t find nuts to completely DESTROY. Like brownies or cookies. Can you really trust someone who loves nuts in their brownies? 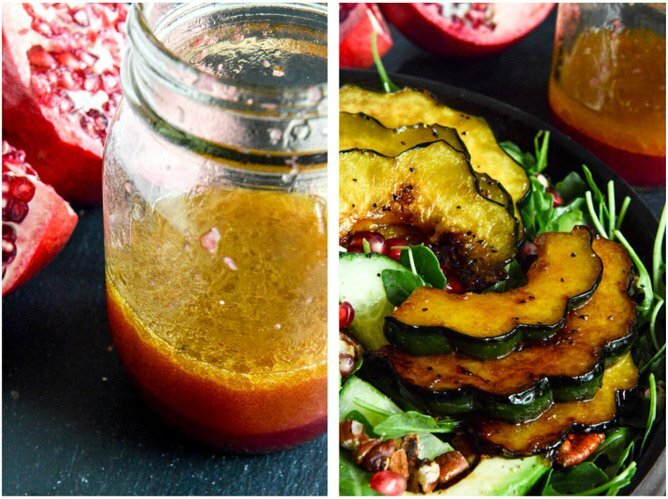 The final step in this healthy fall mess is the pomegranate ginger dressing – pom juice with some freshly grated ginger and garlic and lots of vinegar and oil. 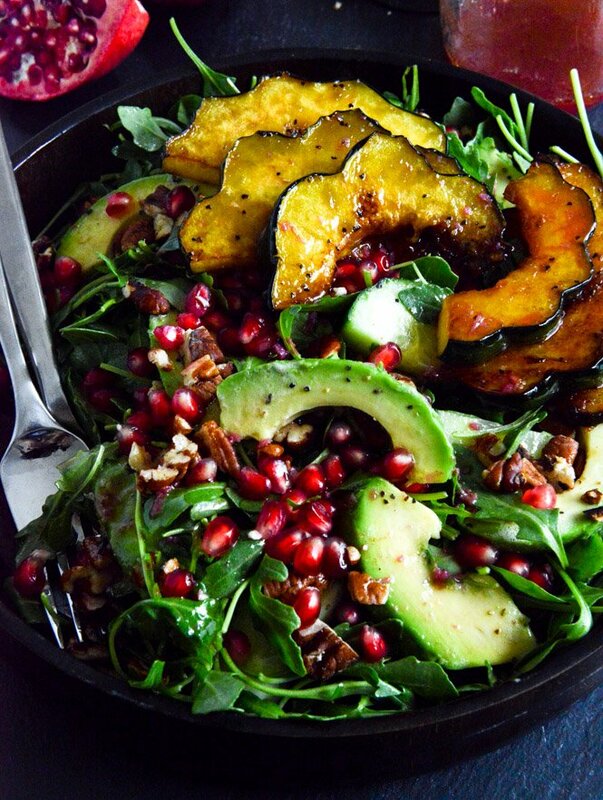 Vinegar is also what makes a salad for me and many times I’ll use my fave pomegranate balsamic to bring everything together. Since I’m all about a salad with as few green vegetable things as possible… this one does me in. I like to eat seasons. Exactly How I Make My Homemade Pumpkin Puree. Pingback: C's picks - week of October 1st - A Life From Scratch. 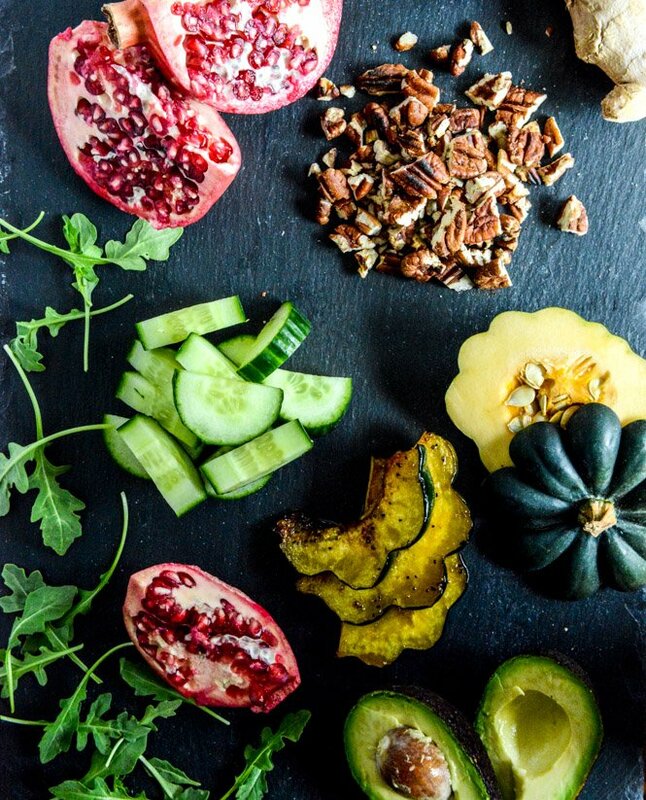 Pingback: 5 Clean Eating Detox Lunches to Boost your Energy and Keep you Full. I love pomegranates too, and this recipe is lovely. I really enjoyed this salad. Great recipe. Thanks for sharing! I’ve been surfing on the web more than 3 hours today, yet I never found any stunning article like yours. It’s alluringly worth for me. As I would see it, if all web proprietors and bloggers made puzzling substance as you did, the net will be in a general sense more beneficial than at whatever point in late memory. Well this is a very informative post. Quite long though helpful. I thought you used to post on this blog per week. It is very interesting to see two wonderful posts in the same week. Thank you for the great article. I also appreciate your responses to the questions posed.